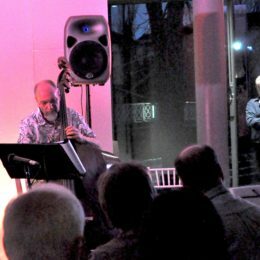 Home > Interplay > Interplay’s International Jazz Day 2016 – ‘Brilliant’! ‘Memorably Great’! ‘A Blinder’! Superlatives are flying after Interplay’s concert with John Etheridge and Si Hayden for International Jazz Day! The event, organised by not-for-profit promotions group In The Moment, saw the Restaurant In The Park (Jephson Gardens, Leamington Spa) full to capacity with the kind of appreciative and enthusiastic crowd musicians long for. The venue itself lived up to high expectations with clean acoustics, a contemporary vibe, and fine views of the river Leam yielding to Rob Sargent’s atmospheric lighting as daylight gave way to dusk. Si Hayden’s opening set showed his unique mastery of the guitar while delivering his own compositions, that were by turns dynamic, expressive and humorous. It was no mean feat to start the evening as a solo performer, but Si did it with aplomb. John Etheridge and Interplay opened gently with Pat Metheny’s lovely tune Hermitage, and then from the following number Spanish Step, the first of several originals by Adrian, it was clear that John and the band were in exhilarating form. Adding a special flavour to the evening’s set were two Soft Machine tunes, celebrating the fact that Alan and John had both played in that epoch-making band, briefly overlapping around 1976 or so (forty years ago!). Gesolreut was a typical Mike Ratlidge up-tempo blast, while Kings and Queens by Hugh Hopper provided a contrasting sense of stately beauty. John gave a beautiful unaccompanied rendition of Goodbye Pork Pie Hat, which he introduced as his favourite tune. In another bandless spot he was joined by Dave on tabla and log drum in a spontaneous African piece that had the whole audience clapping and a few dancing too. A blistering Boogie Stop Shuffle gave everyone room to shine and produced outstanding contributions from Richard and Neil, before Si returned to the stand to exchange guitar wisdom with John over the band’s pulsating version of the Cuban classic Amor Verdadero. You can read more comments on the evening here. Les Grafton of In The Moment took some excellent photos of the night (in challenging conditions) and these are now up on our Gallery page.